Spring 2019 Collection Now Available! It all began growing up in Upstate New York, Schoharie, NY to be specific, a very special place. My grandparents owned a camp on a small lake in the foothills of the Catskill Mountains where we would spend summers fishing and doing all of the other things people do where they’re not fishing. Fishing at that point began to be the passion in my life. 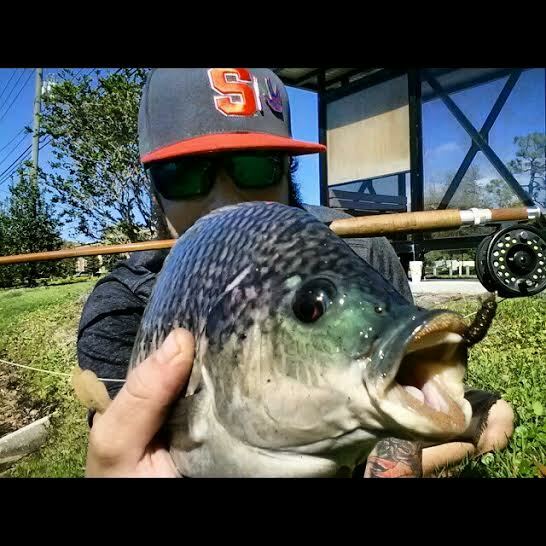 Big Hooters tilapia on a 1950’s Orvis. I began really pursuing fly fishing on a regular basis, when I was getting bored catching smallmouth bass and other freshwater species on spinning gear about 6-7 years ago. 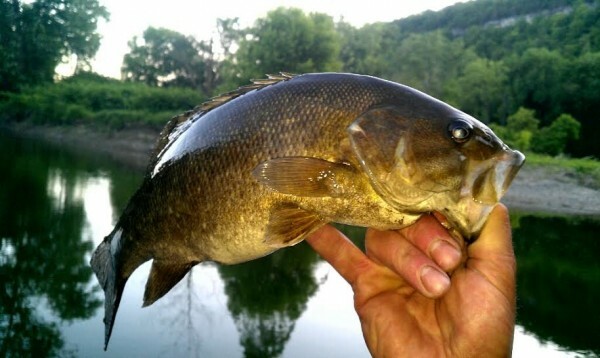 Smallmouth bass became my first obsession on fly, but now it is fly fishing for anything that will eat, both fresh and salt, from tilapia and carp to redfish and tarpon. 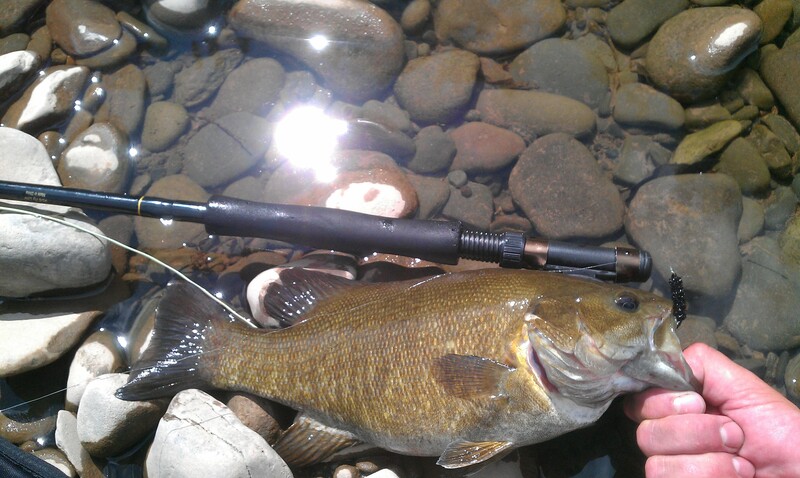 Sight fishing in most situations and the action a fly rod and reel provides is like no other fishing experience to me. It is almost a spiritual connection I have with the fish, when stalking them and getting one to eat. That connection makes me feel like it is my responsibility to take care of whatever fish is on the end of that line and with that said, for me, catch, picture and release is usually par for the course. Hometown bronze. The Schoharie Creek in Upstate NY. 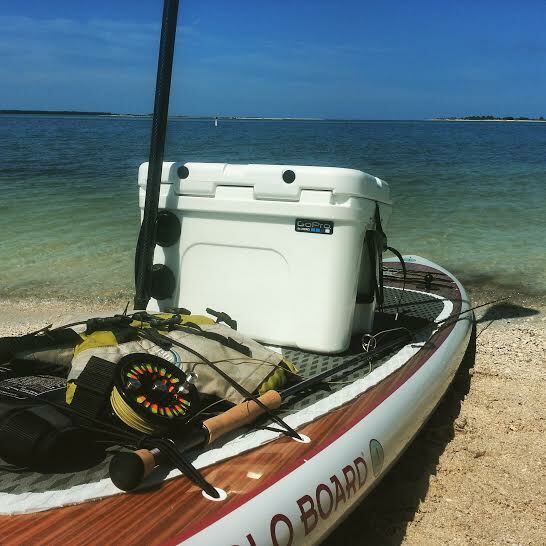 I recently sold my Jackson Coosa and purchased the YOLO Redfish paddleboard, which I mount a 35 qt YETI on so I can sit, or stand and paddle. My very first day launching this vessel with a fly rod, I had one goal in mind – to put myself in range of the mighty silver king. I began paddling with thoughts racing through my head. The rig on Day # 1. Day # 1. Traveling light. I was nervous and intimidated as I saw 3-4 skiffs sitting on the bar, recognizing some of the boats and knowing a few were definitely guides. I felt like the new kid on the block, a little intimidated and wondered what they thought, if anything good, but I hope they respected what I was doing. I knew one guide thought something as he asked, “You’re not gonna sit there are you?” “No,” I replied “I’m just getting some line out.” “Good luck” he said, “I know, I’m gonna need it.” I was new to looking for tarpon via a paddleboard on the beach, so I took that comment as I should probably move or get out of the way, which I respect. I paddled past another skiff and he said, “If you hook one, I’ll come and get you!” We both chuckled and I continued on. I paddled across the shoal looking for some big fish. Then, I see it…maybe 50 yards away, a pod of fish swimming clockwise in a circle known as “daisy chaining.” These tarpon were all big, probably bigger based on the size of my pupils and the rate of my heart. I had never seen anything like this before and just being able to put myself in the company of these amazing fish I felt a sense of accomplishment. I paddled slowly, stalking up the chain of fish until I was in range. I placed 2-3 casts to the right of the daisy chain, stripping down in the direction the fish were swimming trying to catch an eye and a reaction. Watching the video, I was probably stripping too fast, while not focusing on the mechanics of my cast because the adrenaline had taken over. Hence, there were no reactions to my tarpon toad tied on to my 12 wt. The fish broke up and swam off. My next shot came as I saw a line of 30-40 tarpon swimming towards me, on my right side and in range. 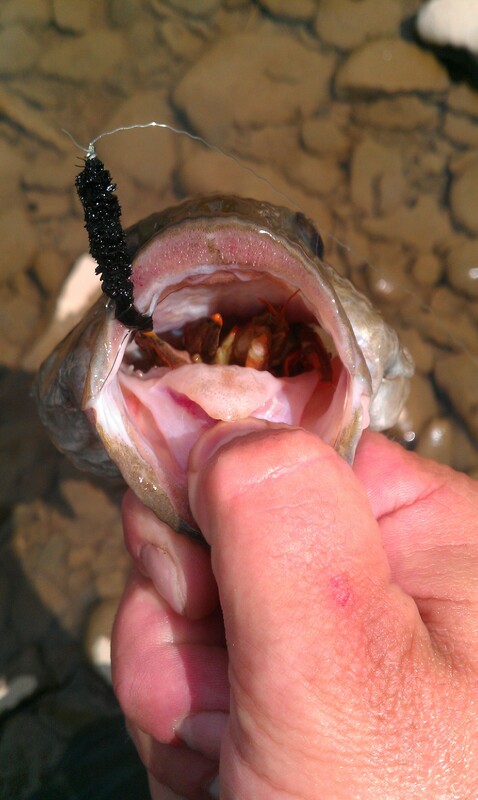 I was ready until I had an epic fail, my leader became tangled at the end of my fly rod. I quickly began trying to remedy the situation by casting out the tangle, and it only became worse. 4 big tarpon left the line of fish to my right, as I drifted out of position. They swam by just to my left, with their tongues out laughing and no chance of them wanting to eat my fly, as I was tending to my tangled leader. If I had a saddle with me, I probably would’ve had a better chance trying to throw it at them being they were so close. The GoPro was running, capturing the evidence of this epic fail and humbling experience. My casting was awful that day and definitely a valuable lesson learned. A Paddleboard + a fly rod + and tarpon = a difficult task, but a desirable one. It will happen. Salt runs through my veins, with tarpon, snook, redfish and the infinite bucket list of fish continually swimming through my mind. Along with the various locations I want to travel to, in search of fish on fly and new experiences, with people I know or maybe people I meet for the first time. I thank the salt and the quality of fish it is home to. This environment demanded an improvement of my fly cast. I am now more accurate with tighter loops, my distance and double haul being better than average, but not expert by any means. Though recently I have felt my cast has moved up a level, way beyond what was displayed in my video. However, I’m sure some stubborn fish and stiff wind will humble it again very soon. It will continue…never give up, always improve, always be humble. Fly fishing changed my life. Now, tarpon have changed my life. 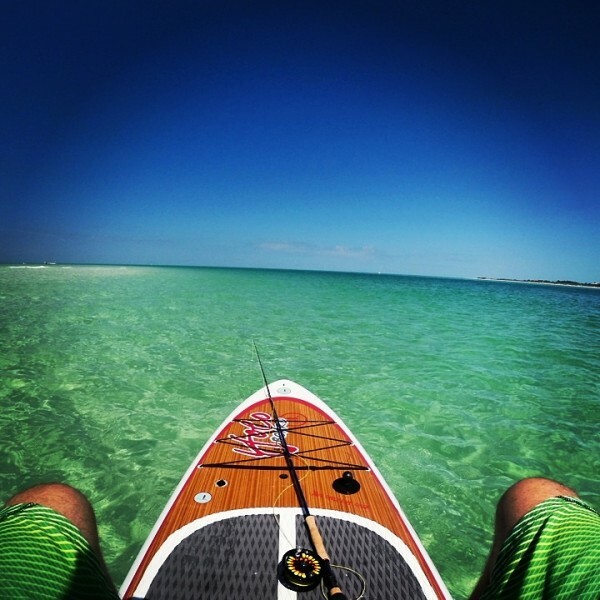 I can’t wait for Spring to continue searching for my first beach tarpon on fly. 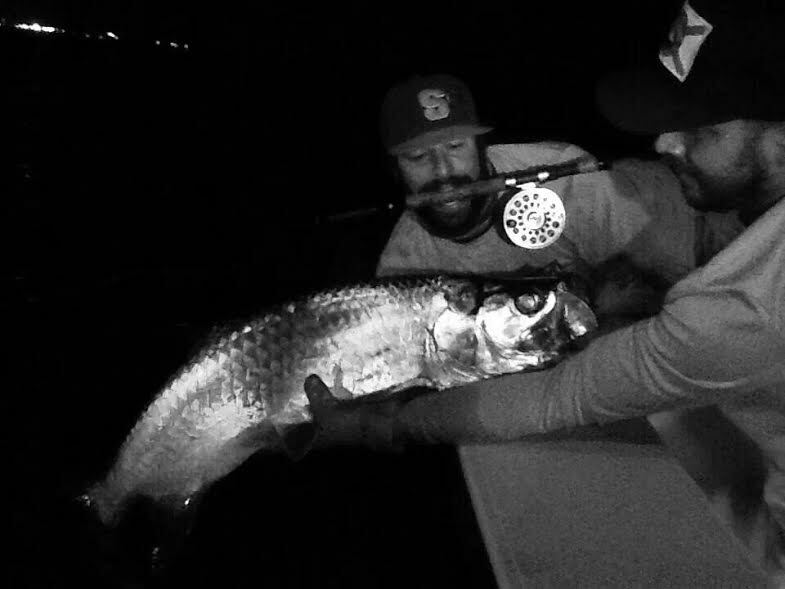 First tarpon ever, thanks to Court and Barracuda Dave. We all have our own story that we cherish, recall it and remember all the great memories, epic fails and what future fish stories hold. Cherish every day; love your family and friends. Follow your passions. RIP Anthony Lawton, my cousin and my friend. Thank you to Vince, Jenn and everyone at Skinny Water Culture, to everyone who shares my passion of fishing, the lifestyle it creates and to the lifelong friendships I have made.